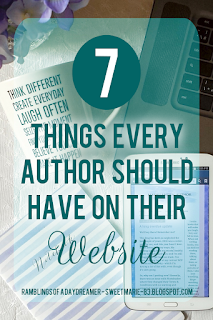 Every author should have a website of some sort, whether it’s a simple blog-type site, a fancy website, or something in between. How you choose to set it up and whether you choose to pay for a domain or use a free platform like Blogger or WordPress is your choice, but it’s important to have a place for readers to find out more about you and your books. 1. An About section. This can be a dedicated page or a snippet in your sidebar. It can be your professional author bio, something more casual, or a mixture of both. Readers like to connect with authors, so give them something to connect to. 2. A list of your books and their reading order. If you have a series or multiple series, be sure to list them in reading order. Even if they can be read as standalones, state that fact, and then have the books in the order of publication; some people will only be interested in reading them in order and not as standalones. 3. A list - with links - of where your books are available to buy. Don’t just say they’re available on Amazon, link to your book pages on Amazon. Make it easy for people to find your books so they can purchase them. If you have signed books available somewhere, be sure to mention how to buy those. It’s also a good idea to link to each book's GoodReads page so people can read the synopsis and reviews, and add it to their TBR. 4. Your social media links. Where can people find you online? Twitter, Instagram, Facebook, Tumblr, GoodReads, etc. If you have an ‘official website’ do you also have a blog? I’ve talked before about how people want to feel connected online, and the importance of building trust with readers. If you’re on social media, make it easy for people to find you so they can interact with you. 5. A way to contact you. This can be something as simple as adding ‘Email me’ on your About page or including your email address with your social media links. You could also have a Contact or Let’s Connect page where you include your social media links and your email. 6. Information about your newsletter. Not just a link to sign up for it, but also what readers can expect. How often do you send newsletters? What’s included? Do you have incentives for being part of your mailing list? 7. Samples of your writing. This can be a whole chapter, a free short story, or an excerpt of your work. An example of your writing can help people decide if they like your style, and entice them to buy your books. Those samples are also a great place to direct readers when contacting them for reviews. A Coming Soon page. 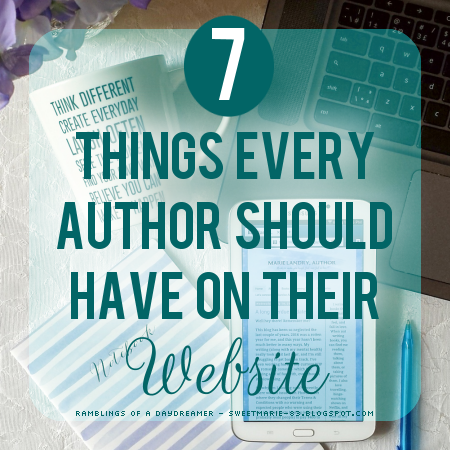 This doesn’t work for every author for a few reasons: Some authors, especially self-published authors, don’t necessarily know what’s next for them because they might have several projects on the go or have no specific publication date in mind. Some authors are under contract and can’t talk about their upcoming releases until the publisher gives them the go-ahead. If you can have a Coming Soon page to give readers something to look forward to, that’s great. You can build on it by linking to things like teasers you post, news about the book, pre-order links, etc.